We’re delighted to present a special lecture on our featured exhibition Painters of the Northwest: Impressionism to Modernism, 1900-1940! 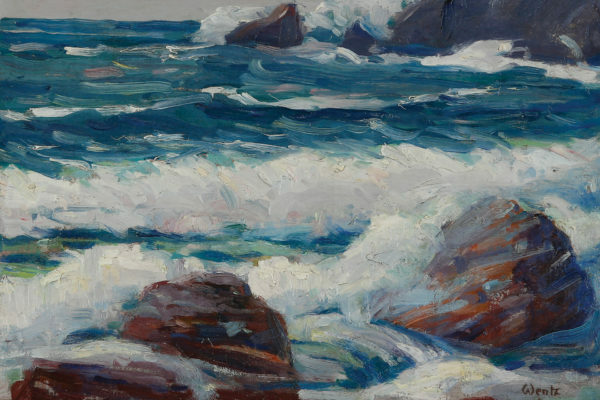 John Impert, author of the accompanying book Painters of the Northwest: Impressionism to Modernism, 1900-1930 will present a lecture on the exhibition in or Middle gallery on Saturday, March 2nd at 10 am, surrounded by the work he’ll be discussing. Painters of the Northwest: Impressionism to Modernism, 1900-1930 is the first book ever written on Washington and Oregon artists active in the first third of the 20th century. Published by the University of Oklahoma Press as the 32nd book in its series on the art and photography of the West, it combines an in-depth investigation of early Northwest art and culture with the beauty of a prestigious coffee table book, in particular its 53 full page color illustrations. The book accompanies an exhibition at the Cascadia Art Museum in Edmonds (until March 31, 2019) with the same title. Most of the paintings featured in the book are included in the Cascadia show. On opening night, January 16, 2019, nearly 400 museum members were in attendance, setting a record for Cascadia. John Impert, the author, is an art historian with a PhD in art history from the University of Washington. A Yale College and Harvard Law School graduate, John worked at Boeing as an international lawyer and government affairs representative in Europe before seeking his masters and doctorate in art history. John is a founding member and currently serves as Vice President of the board of the Cascadia Art Museum.